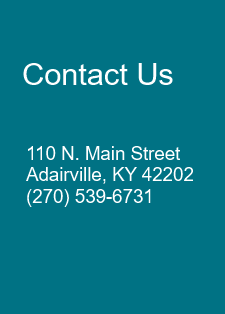 Mission Statement - The City of Adairville will maximize opportunities for social and economic development while retaining an attractive, sustainable and secure environment for the enjoyment of residents and visitors. Through responsible and professional leadership and in partnership with others, the City of Adairville will strive to improve the quality of life for all residents living and working in the larger community. Thank you for the opportunity to serve as your Mayor. I promise to serve this town and do what I feel is right to the best of my ability. It is my hope that my love for this town will show in all I do and to be able to serve until we can see progress in our community again.